Dubbed the “Holy Grail” of bacon that is “made without nitrites or other nasties”, Naked Bacon will be on UK shelves shortly amid a fanfare of claims to be revolutionising the British staple meat. Naked Bacon is the brainchild of Northern Ireland’s Finnebrogue, a sausage and venison supplier to top UK supermarkets, who has worked with a Spanish company, Prosur – producer of natural plant extracts with antimicrobial and antioxidant properties – to develop a new way of flavouring traditional British bacon without nitrites. The natural flavour is produced from natural Mediterranean fruit and spice extracts, following ten years of R&D. The flavour is currently being used in continental-style hams in the EU, but this will be the first time the technology has been applied to British bacon and available to UK consumers, following a £14-million initial investment from Finnebrogue. It will be the UK’s only bacon to be completely free from nitrites, preservatives, E numbers and all allergens, according to the company. The purpose of adding nitrites to cured meat is to impart its characteristic pink colour, texture, some flavour and also to help as a preservative. The WHO has said bacon cured with nitrites is as dangerous as asbestos and smoking, as nitrites produce carcinogenic nitrosamines when ingested. It has estimated that 34,000 bowel and colon cancer deaths per year worldwide are directly attributable to diets high in processed meats – and warned that eating two rashers of nitrite-cured bacon per day increases the risk of contracting bowel cancer by 18 per cent. Every year Brits eat 159-million kg of bacon – worth almost £1-billion in retail sales. Professor Chris Elliott, who ran the UK government’s investigation into the 2013 horsemeat scandal and now chairs the Institute for Global Food Security at Queen’s University Belfast, commented: “Many forms of processed foods have come under the spotlight over recent years for their unhealthy attributes. Processed red meat in particular has been a focal point. “Finnebrogue have used a combination of innovation and natural fruit and spice extracts to come up with a bacon that is made without the need for added nitrites. Nitro containing compounds, used in the manufacture of traditional bacons, are known to cause the formation of chemicals that have negative health impacts. Neil Parish MP, the chairman of the House of Commons Environment, Food and Rural Affairs select committee, says it is great news for the British food industry. He commented: “Making bacon without nitrites – and reducing the risk in the famous full English breakfast – is a remarkable feat of food technology and a brilliant British success story. Denis Lynn, Finnebrogue chairman, commented: “The problem with bacon is dead simple. Bacon contains nitrites, nitrites produce nitrosamines in your gut and nitrosamines are carcinogenic. Nitrites should not be in food. “I’ve been all over the world to figure out a way to make bacon without nitrites – and up to now we’d never made a single rasher of bacon because we couldn’t work out how to do it. For more than a decade I have insisted we not touch bacon until such time as we can make it better and safer – and now we have. Juan de Dios Hernandez Canovas, chief executive of the Spanish company Prosur which developed the new technology, commented: “We are delighted to have an exclusive partnership with Finnebrogue to bring bacon made without nitrites onto the UK market for the first time. “Our processing technology and natural flavouring mean nitrites are no longer required in processed meats. As well as Naked Bacon, Finnebrogue will be bringing Naked Ham to market. The first packets of Naked Bacon will be in supermarkets on January 10, 2018, while Naked Ham launches on January 15, 2018. 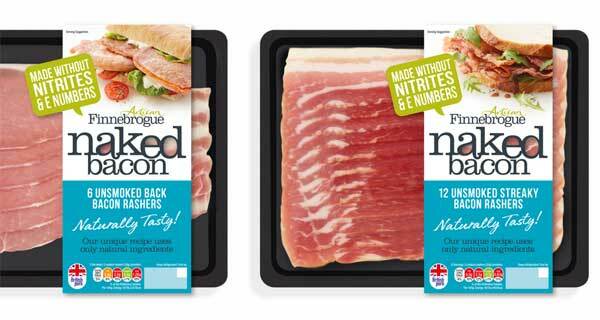 Finnebrogue is also producing the nitrite-free bacon for Marks and Spencer who will be packaging the product in its own brand, to go on sale in early January. Kirsty Adams, Marks and Spencer product developer, said: “We know that our customers care about their health and are increasingly looking for healthier options for themselves and their families. We have worked closely with Finnebrogue throughout their innovation on nitrite-free bacon, to ensure our own brand recipe is a fantastic tasting bacon without compromise on flavour – as our customers would expect.